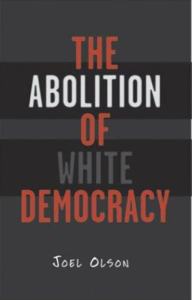 Offers a new way of understanding the tortured relationship between race and democracy in the United States. Joel Olson contends that, given the history of slavery and segregation in the United States, American citizenship is a form of racial privilege in which whites are equal to each other but superior to everyone else. To break this pattern, Olson suggests an “abolitionist-democratic” political theory that makes the fight against racial discrimination a prerequisite for expanding democratic participation. Purchase the book at Minnesota Press. Over 100 recipes designed to destroy the government, complete with musical notes to accompany the chef. A sure-fire winner for every revolutionary palate. Cast off the chains of corporate food dependency! 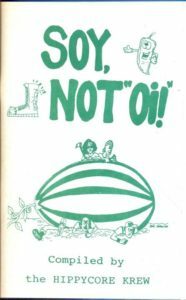 Twenty-five years after the publication of the original Soy Not Oi, the Hippycore Krew returns with a second volume featuring a worldwide cast of contributors! 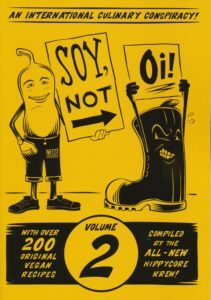 The new Soy Not Oi is filled with over 200 original vegan recipes, and suggested musical accompaniments. Plus: essays and articles about the origins of Soy Not Oi and living la vida loca – vegan style; a whole chapter on craft beer brewing; inside ribbings, zaniness, vegetables gone mad, and all the rest you would expect. You can purchase a copy from AK Press.